I recently spoke at both Search Marketing Expo Toronto and Pubcon South in Dallas. Now, neither was my first time speaking in front of people. I’m a three-time bridesmaid, you know, so I’m getting pretty used to speaking in front of 200 strangers. Father of the Bride’s drunk relatives? No problem. However, this was my first time speaking in front of people who’d paid several hundred dollars to be there and expected to come away with some new knowledge. That was totally intimidating. It has been said that one of the best ways to learn something is by explaining it to others. Speaking at conferences is also a way that those of us in the search industry can give back to the community, particularly if you were once a wide-eyed n00b in the audience at a search conference. So I wanted to do a good job. In hindsight, I even think it was perfect that these events were separated by only a week, as it gave me a chance to compare them both and learn from where I went right — and wrong — and then show you. Here’s what I learned as a first-time conference speaker. So you’ve pitched a topic, you’ve been accepted, and now you have to prepare your PowerPoint deck. You’ve been given a company branded template to use, but it’s blank. Where do you start? I started with a rough outline of the topics I wanted to cover. Actually, kinda the same way I did for writing this blog post. You don’t have to stick to your outline if you find cool new info along the way or realize you’re off in the complete wrong direction; it’s just a place to start. When you think you’ve got your topics figured out, start fitting them into the deck. They say the rule-of-thumb is one slide per minute that you are speaking. When you’re talking on a panel with three or four other people, you get about 12 minutes. I completely broke that rule on both presentations. Despite both of them being approximately the same number of slides, my SMX presentation went long, while I felt a bit rushed during my Pubcon presentation. It happens. When you’re writing out your points, keep them to a minimum. I tried to do no more than 3 bullets per slide. You have an entire minute to expand on them verbally, and its way more interesting if what you say is not identical to what people can read. If they can just read it off the slide, they don’t need to actually be there. We all had that professor in school who read directly off the slides, and we all hated him for wasting our time and money; don’t be that guy. Use lots of visuals. Some people are more visual learners, so don’t leave them out. I did this in my SMX presentation, but not so much in my Pubcon one. Lesson learned. Also, use lots of examples. Take them from your personal experience; people don’t want the textbook answer for how they are supposed to do something, they want to know how you did it in a real situation. Prepare, prepare, prepare. Unless you’re the type who can talk about anything off of the top of your head, you need to prepare. I’m the type who forgets her own name when put under pressure. Review your PowerPoint. Make notes about what you plan to talk about, in addition to the bullets in your slides. Read it out loud to a friend, if you’d like. Make sure it all makes sense and that you’ve covered all your bases, and do that well in advance. Making last minute changes to your deck can leave you feeling somewhat unprepared. I may have done this with one of my decks. Maybe. And then I may have ended up skipping over an entire slide in my presentation. Of course, no matter how much preparation you do, there are things that are outside of your control. If you end up on a panel that is totally in sync, both in personality and in topic, that’s going to boost your confidence and increase the learning opportunity for the audience. One of my sessions was exactly like that; our topics just fit with each other, and that made the whole session feel really dynamic and my own presentation that much more relevant. But if your topics aren’t quite aligned, that can make the session run awkwardly. 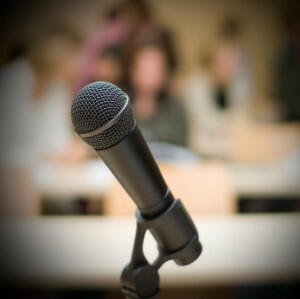 It can make it more difficult to get into the flow of your presentation. And it’s not a reflection of the speakers or their presentations, sometimes that’s just how it is. This is a big one for some people, and totally prevents them from ever speaking in public. And it’s understandable, nearly everyone gets nervous. Strangely though, I’d rather get up and speak in front of a room full of people than call for pizza. I love that ordering online means I never have to speak to a stranger on the phone again. It’s also different when speaking in front of people you know versus strangers. I didn’t know anyone in the audience during my SMX talk, but knew a few during my Pubcon one and I was much more nervous about that one. Obviously this is something I’m going to have to learn to deal with, as doing this more and more is going to mean a lot more familiar faces in the audience. Any feedback you get is great, even seemingly negative feedback. Take that as constructive criticism and use it to tweak things for the next time. Your first speaking events don’t have to be “I have a dream” quality (mine certainly weren’t). The biggest thing I was afraid of was that people would be judging me. It turns out, people judge you way less than you judge yourself. It’s a search conference, not American Idol, and people can be pretty forgiving of your little slip-ups. In the end, I got some pretty great feedback on both of my presentations. It seemed that people were able to take away some information from both, and clearly I’ve learned from the process as well. Hopefully, all of this means that my next speaking event (SES Toronto in June, by the way), will be that much more awesome.